Services — Recommended Standard Inc.
From the first discussion about the project and scope to final testing and education. We will work to provide your project a complete system program from design to commissioning to testing and training. Its the sound of over 25 years of audio engineering experience. 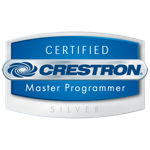 We can build you a perfectly sounding solution using the AVIA toolset from Crestron. When all you want is a module to control the thing that you just want to work. Well sometimes there just isn't one and you need it built. We can help you create the module you need so you can go on getting jobs complete and functional.